True education ensures the harmonious development of the physical and mental abilities of a child and transforms a child to a self reliant, ambitious, motivated individual, with the best positive vibrations and inbuilt ability to succeed. Mata Amritanandamayi Devi, 'Amma' to millions all over the world is a Satguru, imparting wisdom to all through her extraordinary acts of love and self-sacrifice. 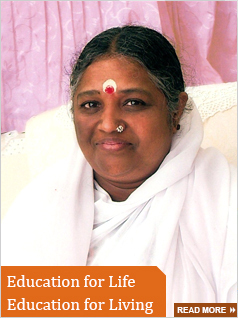 Amma believes there are two types of education; 'Education for Life' and 'Education for Living'. Amma places higher emphasis on 'Education for Life' or 'Spirituality', to lead a life based on values and at the same time stresses on 'Education for Living', which enables people to walk the path of the world and earn their livelihood. Integrating the two helps create professionals in all fields with the skills, mental strength and the heart to uplift humanity. Roll out of Online Labs in CBSE affiliated schools across the country. February 16, 2013.